Editors Note: The FDA approved a second CAR T-cell treatment for large B-cell lymphoma on Wednesday, Oct. 18, 2017. It is the most common type of non-Hodgkin lymphoma in adults. Go here to read more about the latest approved treatment. FDA Commissioner Scott Gottlieb, MD, called the approval of the therapy -- brand named Kymriah -- a "new frontier in medical innovation." In a news conference on Wednesday, Gottlieb said the FDA had 76 active investigational new drug applications related to CAR T-cell products, and more than 500 for gene therapy products are being studied for a variety of ailments, ranging from genetic disorders to autoimmune diseases, diabetes, cancer, and HIV. "New technologies such as gene and cell therapies hold out the potential to transform medicine and create an inflection point in our ability to treat and even cure many intractable illnesses," Gottlieb says. Fung, who's also vice chairman of hematology/oncology at Fox Chase, says the treatment could help patients beat back an illness that has resisted conventional treatments like chemotherapy and radiation, leaving them facing death. “This is the breakthrough of the century,” he says. And Hetty Carraway, MD, an acute leukemia doctor at the Cleveland Clinic, says the newly approved therapy represents a first step for a new way of treating cancer. “If it can bring this kind of paradigm to other types of cancers, that’s really where I think the larger implications are,” she says. B-cell acute lymphoblastic leukemia attacks the blood cells that make antibodies, which help your body fight off disease. Most of the time, it’s treated successfully with chemotherapy, radiation, or by transplants of bone marrow, which produces blood cells. But in some cases, treatment fails to beat back the cancer, or it comes back. When that happens, the odds of survival fall to as little as 1 in 10. The new treatment is a one-time infusion developed by researchers at the University of Pennsylvania and the pharmaceutical company Novartis. 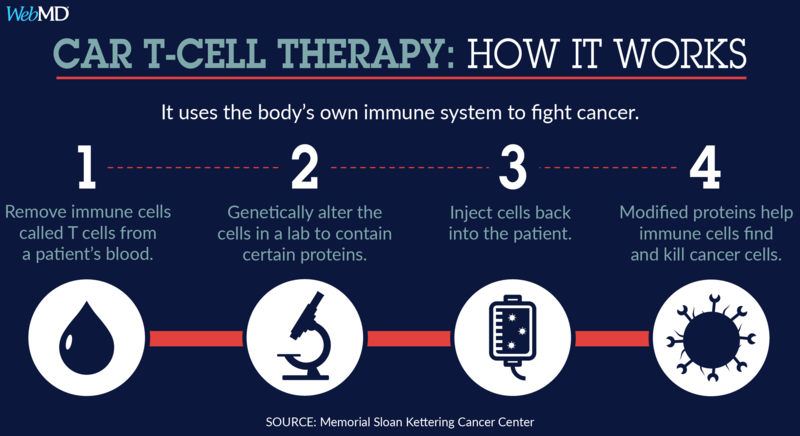 Officially known as chimeric antigen receptor T-cell therapy, it starts with doctors extracting disease-fighting white blood cells, known as T cells, from a patient’s blood. The cells are frozen and shipped to a laboratory, where they’re genetically engineered to attack a specific protein on the cancerous B cells. They’re then put back into the body, where they seek out and destroy cancer cells. And because they’re cells taken from the patient’s own body, there’s no need for anti-rejection drugs, which are needed after transplants. The therapy can have dangerous side effects -- mainly a condition known as cytokine release syndrome (CRS). That happens when T cells release a lot of a chemical messenger into the bloodstream. This affects the vascular system, causing high fevers and sharp drops in blood pressure. More than 60% of patients in clinical trials had side effects due to cytokine release, Novartis reported, but none of those reactions were fatal. Emily Whitehead, the first pediatric patient to try the therapy in 2011, had such a bad reaction initially that she was in a coma for 14 days. Her doctors told the family to say their good-byes. “They believed she had less than a 1-in-1,000 chance of surviving to the next morning,” says her father, Tom Whitehead. As a last hope, doctors gave Emily the arthritis drug Actemra (tocilizumab), which blocks one of the main inflammatory signals driving the CRS. On Wednesday, the FDA also approved Actemra as a treatment for CRS. In fact, under the conditions of approval, doctor's can't use CAR T therapy unless they also have Actemra on hand to manage side effects. Within 12 hours, Emily started to recover. She has been cancer free for five years. Because of the side effects, Kymriah won't be available everywhere. Hopsitals and clinics will have to be specially certified to administer the treatment. Doctors and other staff will also have get additional training before they can prescribe it. “We know and expect that type of side effect will happen, and we know that we can successfully manage it,” she says. “But it needs to be managed by people who are familiar with this type of side effect and how best to support patients,” Carraway says. Other side effects included anemia, nausea, diarrhea, and headaches. In three trials involving about 150 people, the remission rates were 69%, 83%, and 95%. A total of 17 patients died after receiving the treatment; 14 of them from the disease and three from infections, according to documents the company filed with the FDA. Another concern is the price tag associated with the therapy: The process is reported to cost as much as $475,000. In a press release, the Center for Medicare and Medicaid Services (CMS) announced that it was exploring "innovative payment modes and arrangements" for Kymriah and other potentially life-saving treatments. In a news release, Novartis, the company that makes Kymriah, said it was collaborating with CMS on an outcomes-based approach to pricing, which would mean that the company would only be reimbursed if a patient responds to the therapy by the end of the first month of treatment. “Our hope is we’ll get better at making these medications, and hopefully, with time, the cost of this will decrease,” she adds. Novartis spokeswoman Julie Masow says the company will do “everything we can” to help get the treatment to patients who need it. “We are carefully considering the appropriate price for CTL019, taking into consideration the value that this treatment represents for patients, society, and the health care system, both near-term and long-term, as well as input from external health economic experts,” Masow says. One of the more recent patients to have CAR T-cell therapy is 5-year-old Liam Thistlethwaite. He has been cancer free for 4 months since starting the therapy to treat his acute lymphoblastic leukemia. First diagnosed shortly before his second birthday, Liam had gotten 32 months of different kinds of chemotherapy drugs to poison the cancer out of his small body. The treatment is harsh but almost always successful. Doctors told Liam’s parents he had a 96% chance of a cure if he could finish it. But 8 months later, Liam’s cancer came back, with a vengeance. Leukemia cells spread to his spinal fluid. Tumors grew on two glands in his brain. Liam’s doctor, Ching-Hon Pui, MD, chairman of the Oncology Department at St. Jude, had recently been to a medical conference that discussed the results of the CAR T-cell therapy. He convinced Children’s Hospital of Philadelphia to put him on its waiting list, which was about 6 months long at the time. Because Liam was relatively healthy and had a low cancer burden when he was treated, his father thinks he avoided some of the most severe side effects of the therapy. He spiked very high fevers and spent a few days in the hospital but pulled through. “He’s started school. He’s doing wonderfully,” says Patrick Thistlethwaite. One of the unanswered questions is how long CAR T cells can last in the body. In some patients, they’ve persisted for as long as 5 years. Others have their cells die in weeks or months. 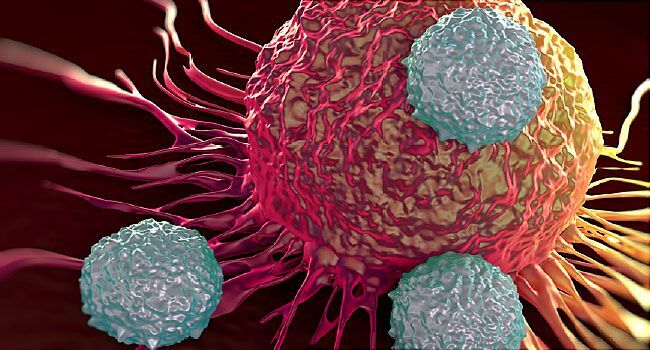 Another big question is whether the cancer will come back if the CAR T cells are gone. The Thistlethwaites say it was very hard to know whether to try CAR T on a toddler. “Our physician truly felt that we’d have the same odds, so to speak, as going into a stem cell transplant with heavy radiation. He believed CAR T to have high side effects up front, but no high long-term side effects," Patrick Thistlethwaite says. They knew radiation to Liam’s brain and spinal cord could cause long-term damage. Henry Fung, MD, director, Fox Chase Cancer Center-Temple University Hospital Bone Marrow Transplant Program. Hetty Carraway, MD, acute leukemia doctor, Cleveland Clinic. Ching-Hon Pui, MD, chairman, Department of Oncology, St. Jude Children's Research Hospital. Tom Whitehead, The Emily Whitehead Foundation. Drug maker Novartis is a sponsor of the foundation’s upcoming Believe Ball, which raises money for children’s cancer research.